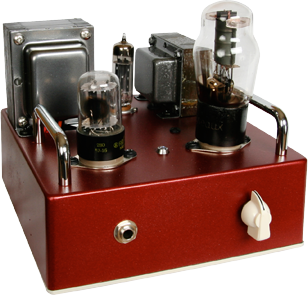 The 5-watter (more like 7-8) uses a tube complement of 1-6×4 (directly-heated cathode, rectifier tube), 1-6SN7gt or 6SL7gt (higher gain) preamp tubes and a NOS 6V6GT cathode-biased, output tube. The power supply uses a CLC filter (choke filter for better voltage regulation). The filaments of the tubes have their own/separate power supply (filtered DC for NO HUM operation). The power transformer is over-rated and LOAFING. The output transformer is VERY-HIGH quality. It will drive any 8 ohm cabinet. The only controls are Volume and ON/OFF. No tone/gain-sucking tone controls. High-visibility, Blue LED for a pilot light. I use only premium componentry: Allen Bradley (or wire-wound) (very low-noise BTW) resistors. Low-leakage filter capacitors. Ceramic sockets. NOBLE volume pots. Sprague Orange-Drop capacitors. At your request, we have premium polypropylene or oil/paper caps. Teflon-coated, silver-stranded hook-up wire. 3-prong AC cord. Heavy-Duty 10A on/off switch. We’re using Hammond, cast aluminum chassis’ for “gravitas”. It also has the added benefit of tremendous shielding from RF interference. Solid bottom-cover. Screwed-in rubber feet. Chrome or Satin-chrome handles. How’s it sound? Like a tweed Champ! Nice, clean and refined. Touch-responsive. Until you reach about the 4/5 position! Then the creamy/distortion starts kicking in! Since it doesn’t have tone controls, there’s PLENTY of gain in reserve. From 6>on, the signal gets thicker (not necessarily louder). Lots of 6v6 “bite” when doing lead lines. More sustain. With power chords, the individual notes are still focused because of the linearity of the octal preamp tubes. Great amp for recording or bedroom/living room jams. The ability to get compressed/thick chords. I tried it on a 4 X 10 bass cab as well as a 1 X 12 JBL (very efficient). You will be surprised how loud 5 watts can be!